Publisher: The Music Class, Inc. This book is designed to be a dynamic supplement to a beginning student’s method book. 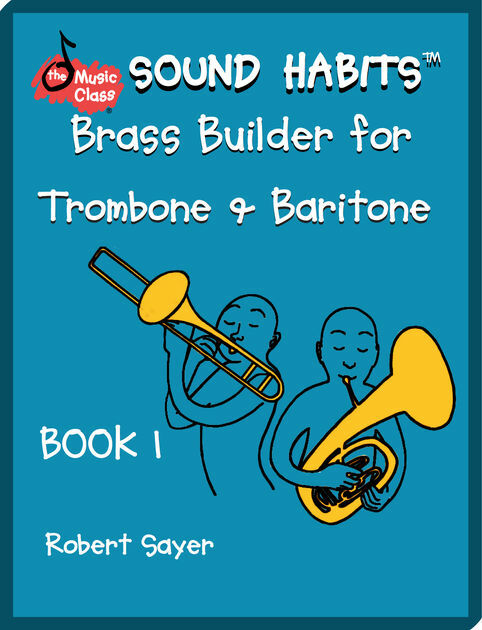 Consisting of two main parts, the first contains brief instruction, ideas, and suggestions for correcting or avoiding poor technique, including how to prevent puffed cheeks, how to produce a proper buzz, and how to develop the correct openness in the mouth while breathing and playing. These topics are covered in appropriate language for a younger beginner, and provide enough tips without becoming too technical. The second part contains eight series of exercises to be played along with a CD recording. I think this part is especially effective in helping a beginner learn how to effectively practice, and the CD recording is designed to provide a good sound model from a professional musician. The series has students developing practical sound production skills utilizing various popular styles, such as the blues, rock, and familiar children’s songs. Topics covered in the second section include buzzing, melodic performance, and the development of aural acuity in sound production. This book is a valuable tool for the beginning player under the guidance of a competent instructor.